Unfortunately Tattoos seem to have a bad reputation for being solemn and gothic-looking. But who knew there's a whole array of beautifully fresh, vibrantly colorful designs out there? You can get one of these air-brushed onto your skin and if you like it, you can always make it more permanent. #1 - This beautiful hummingbird. Dynamic and cute, and fits right onto your shoulder blade. A beautiful way to show off your shoulders in the spring. 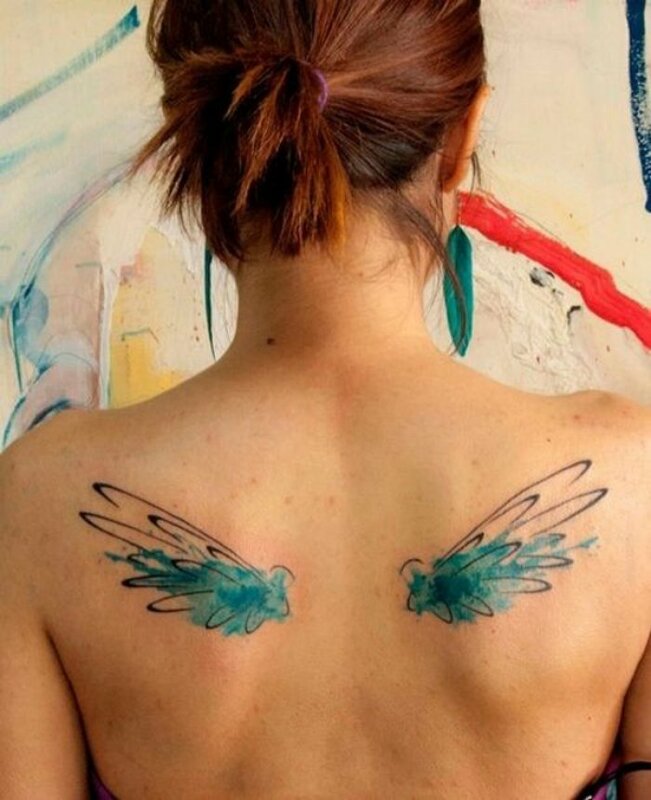 #2 - These bold little wings for those with a bit of an alter-ego. You didn't make it to Victoria's Secret, but these wings will most definitely make you an ink-angel. #3 - This mystic and somehow spiritual tree. Grounded, down-to-earth, and amazingly delicate design. 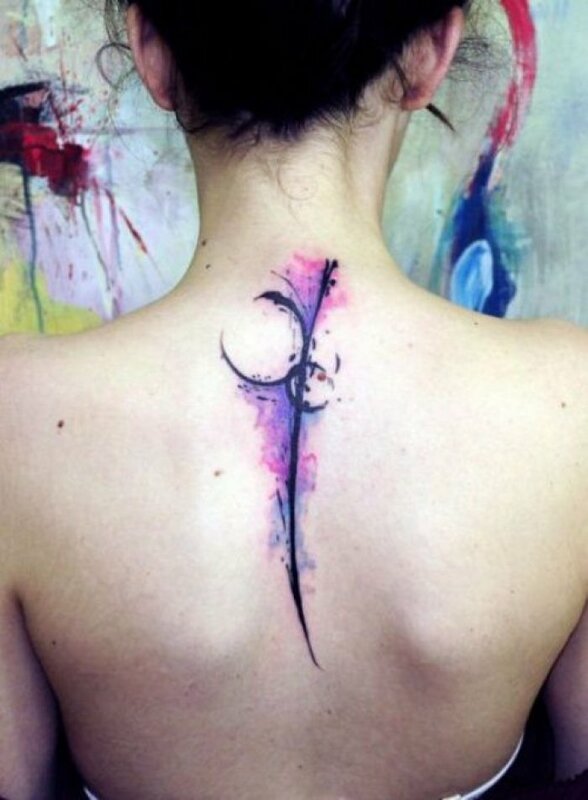 With a tattoo like this, you should always wear a backless dress. #4 - This shockingly bright fox. 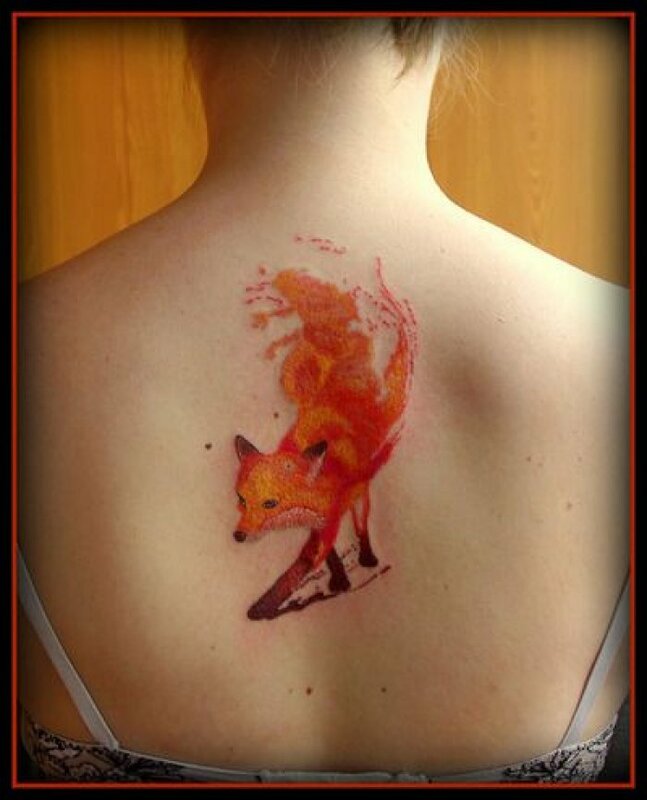 A shock of color between your shoulder blades that suddenly take the shape of an elusive and artful little fox. #5 - This exotic purple feather-looking thing. Simple, sharp, and sophisticated. If you're looking for something subtle, yet not so boring, this is the perfect design. 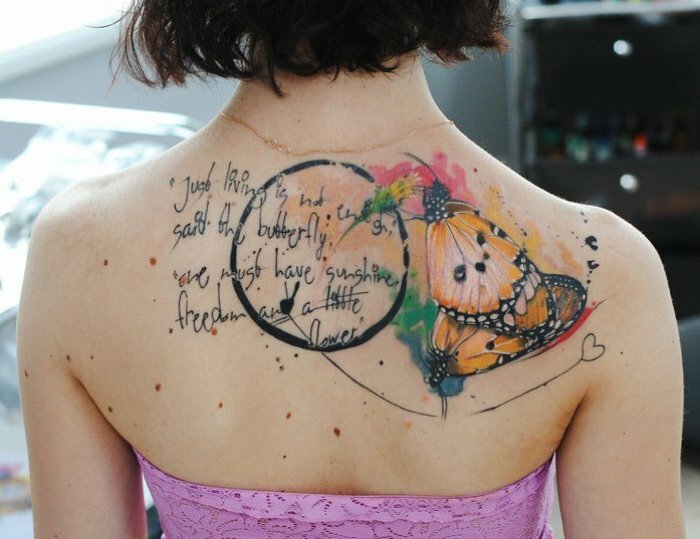 #6 - The classic quote and butterflies. Everyone knows you can't go wrong with butterflies. Add in a thoughtful phrase, and you've got yourself the most traditional tattoo ever. 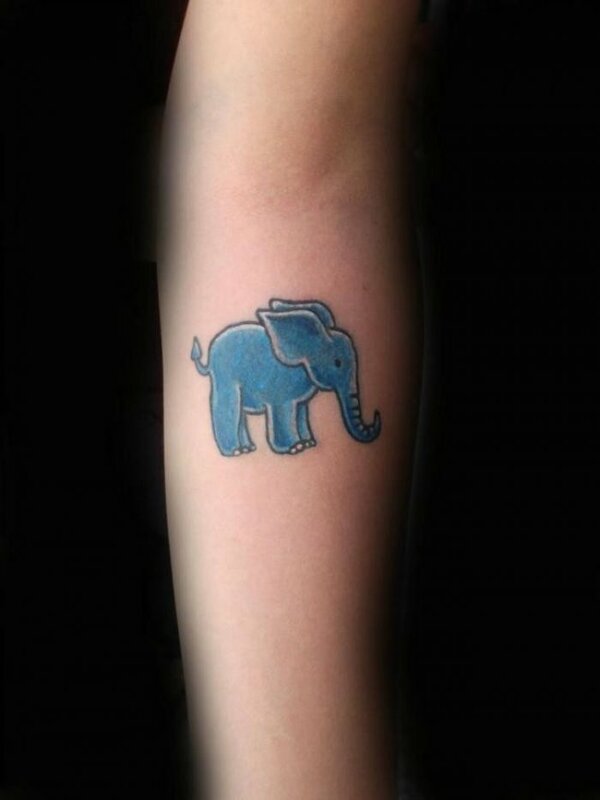 #7 - This cute blue elephant. Whether you've been to Thailand or not, this is a bold, quirky little design in a bright sky-blue hue. We're pretty sure it wouldn't opt out a teaching career either. #8 - This halter-bow-tie design. 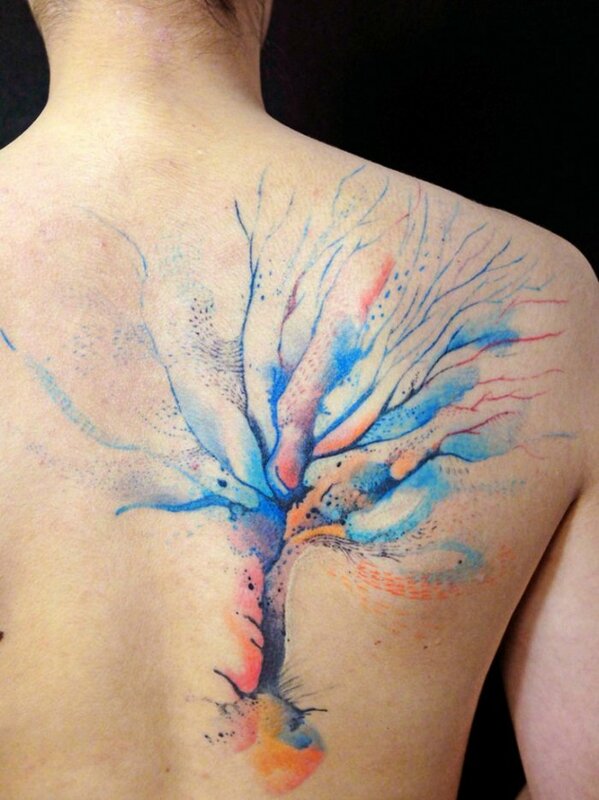 This is kind of like a disguise-based design because it could be a tattoo or the back of a frilly dress- very creative and colorful. #9 - … umm, do we need to say anything other than Phoenix. This is great for a whole array of nerds- from Harry Potter to X-Men, the Phoenix will always be a symbol of awe and beauty. 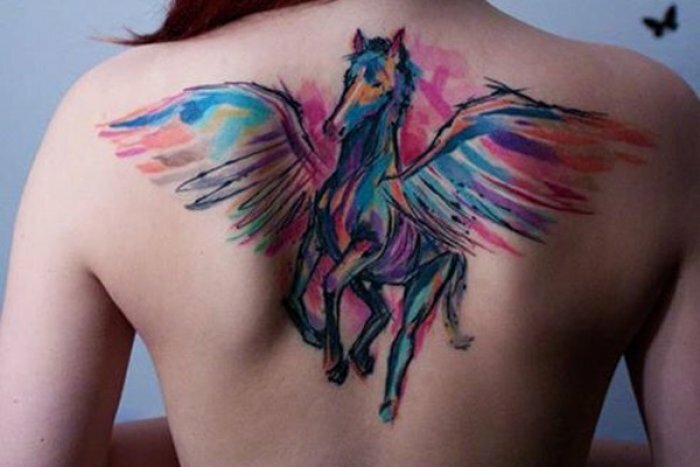 #10 - A multi-colored, winged horse. There are so many things right with this design, I can't even contain myself. Bold and bright across your shoulders, flexing its wings as you shrug your shoulders, and dynamically powerful.